IF you’re looking for OOTD (outfit of the day) inspiration for modest fashion from homegrown Instagram darlings, chances are you’re already familiar with the Farah sisters. To the uninitiated, Farah Ilyana Khairuddin a.k.a Yana, Farah Mislina (Farah) and Farah Azrina (Azrina) are the brains behind CalaQisya — a brand which has stamped its mark in stylish modest apparel for the past nine years. Each sister has a different personality and educational background. Yana, the eldest, is soft spoken and holds a Master’s degree in industrial chemistry. Farah, the second sister, is determined and firm, and is trained in mechanical engineering. The third sibling, Azrina, is bubbly and happy-go-lucky and has a diploma in investment analysis. Despite the differences, the sisters, all in their 20s, are one when it comes to fashion — they love to dress up and have a natural flair in dressing up in style with the tudung. Their creativity and impeccable sense of fashion have turned them into style icons with 562,000 followers on Instagram, 237,000 on Facebook and 8,030 on Twitter, all diehard fans nicknamed the Cala Queens. 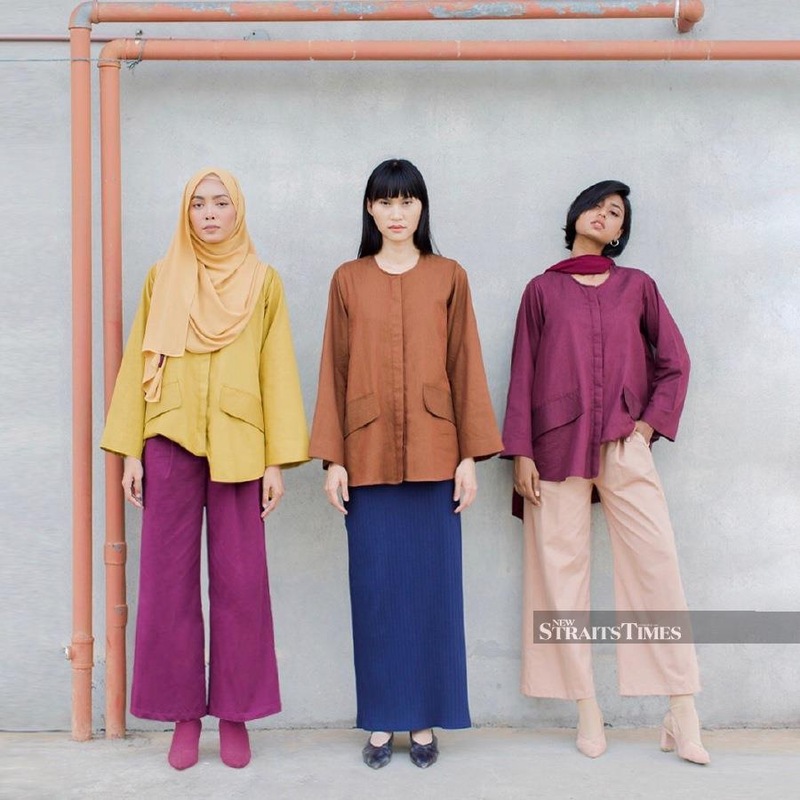 With a prominent online retail platform and five stores in Selangor, Kuala Lumpur, Johor and Perak set up within a decade, the sisters are moving towards building a fashion empire. The idea for the brand came up when Yana blogged as a hobby while pursuing her studies at Universiti Teknologi Malaysia, Johor. Her readers started requesting information about her OOTD and that was when she roped in her sisters to start a fashion business. “We started by selling tudung that we sourced from suppliers. They were snapped up within minutes every time we came out with a new design. “That’s how CalaQisya started. CalaQisya is a combination of two Arabic words meaning ‘the castle of the good life’. Our aim is to continuously put up fresh ideas to fill a Muslim woman’s closet with fashionable pieces that will make her feel good about herself,” says Yana who is CalaQisya’s chief operating officer. The brand takes modest wear very seriously especially with regards to practicality and functionality for women of all shapes and sizes. For example, the brand was among the first to come up with the “tudung stetoskop” — a piece with slits at the ears designed for earphone users and doctors. CalaQisya’s chic yet modest concept and designs also appeal to non-Muslims. Its latest Comfortwear range, for instance, is winning the hearts of women. “When we started, we retailed things that we love to wear, mostly clothes that are practical and comfortable. We work on that principle — just like our tagline — throughout the business. We make and sell items with all the necessary details that will solve common problems we face in modest fashion,” says Farah, who is the operations and human resource director. And when it comes to sizing, the sisters really walk the talk. “Our advantage is definitely the sizes of my sisters and I. In other words, we have real testimonies from women who wear S, M and L/XL. That makes our job easier because we understand the issues of each size and work with each other to come up with the best designs and the littlest of details like elasticated waistband for the plus-sized, the use of creaseless materials, the length of the blouse, skirt or sleeves, roomy and functional pockets and many more,” she says. Fashion-wise, the sisters stay true to creating designs that cover the aurat yet with a trendy appeal, says Azrina, the creative director. “That’s our main priority. For instance, we classify the opacity level of a garment from a scale of 1 to 5. We always make sure that our customers know what they are buying. If the material has an opacity level of 1, for instance, that means the garment must be worn with an outerwear or layered with an inner wear. “We also make sure that each tudung has the length or is styled in a way that will cover the chest completely,” she says. What makes Cala Qisya stand out is the fact that it does not keep up with trends but sets the tone by rolling out various collections without adhering to the standard seasonal launchings throughout the year. “We find it a challenge to follow what’s in the market. We also don’t follow trends because that would be exhausting especially when the three of us have different tastes. And just like other siblings, we do bicker when it comes to business. So, following a trend is a bit tricky for us,” says Farah. “Basically, we roll out a new design almost every week. We just go with the flow and design a piece based on whatever ideas that pop into our minds. “We work with whatever resources we have and promote our designs aggressively via our social media network,” she says. “To win customers, our secret is sisterly love — we treat our customers like siblings. In a way, it drives away the haters too. “And yes, we’re connected 24/7 with customers because we believe that quality products must be supported with strong engagement and swift response to drive long-term loyalty for the brand,” she adds. The brand has just launched Calaraya 2019 for Hari Raya and opened a new store at Central i-City in Shah Alam. So, what’s next for the Farah sisters? “Seeing Cala Qisya as a strong household modest brand in Malaysia. And perhaps, a fashion empire eventually?” says Yana.